The primary goal in treatment of neurogenic bladder (NGB) is preservation of renal function, which is maintained with low storage pressures. 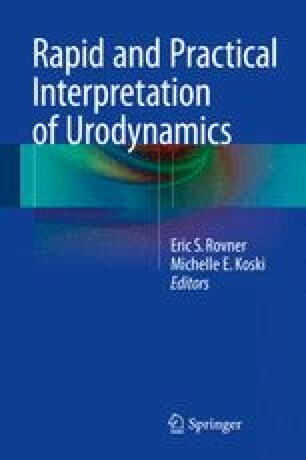 The mainstay of evaluation of patients with NGB is urodynamics (UDS). UDS is essential in managing patients with NGB as most patients will require treatment modification based on their studies. More importantly, Nossier et al. demonstrated that up to 68 % of asymptomatic patients might be at risk for upper tract disease that would be otherwise undetected without UDS. Specific considerations during the study include patient positioning and autonomic dysreflexia (AD). Patients must be monitored closely during UDS for symptoms of AD as well as continuous blood pressure (BP) monitoring, as a portion of patients will be asymptomatic. If an episode of AD occurs, immediate bladder emptying followed by possible oral or topical medication can be used to lower BP. The use of fluoroscopy in patients with NGB is widespread as it allows one to evaluate the upper tracts for vesicoureteral reflux (VUR) and the outlet for detrusor-sphincter dyssynergia.